To make the cream layer, whip the cream until stiff peaks form. Add the softened cream cheese and sweetener to taste. Mix until creamy. 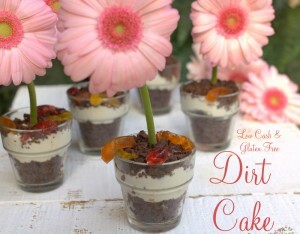 To assemble, place 2 tablespoons of “dirt” into a small serving cup. Top with 2 tablespoons of the cream filling, then top with another 2 tablespoons of “dirt.” Garnish with “healthified” gummy worms if desired. To make the gummy worms, place the STUR natural sweetener in a heat-safe cup. Add the gelatin and stir until dissolved. Add the water. Heat in the microwave on high for 40 seconds or until boiling. Add citric acid if you would like a touch of "sour" taste. Stir well. Pour into gummy worm tray. Place in fridge until set.